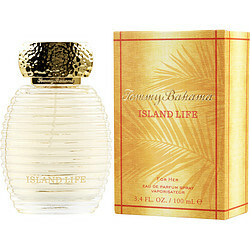 Take one whiff of Tommy Bahama's Island Life for Her, and get ready to spread out your beach towel and soak up the sun's rays. Created in 2014, this women's fragrance evokes thoughts of cool blue waters and palm trees blowing in the breeze with its top notes of star anise. At the heart, soft, inviting peach blossom reminds you of sipping a frozen drink, while lingering vanilla is cozy and comforting, just like the warm sand between your toes.